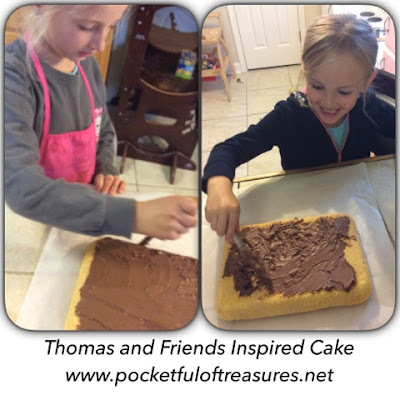 Have you seen my Cake Decorating for Kids post? 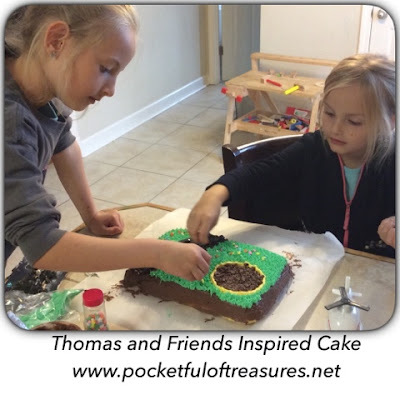 What started as a project for the American Heritage Girls Cake Decorating badge has turned into a family passion and hobby. This week our oldest son celebrated his 4th birthday, so of course the girls just had to make him a cake. He requested Diesel 10 and Harold the Helicopter, and that is what he got! 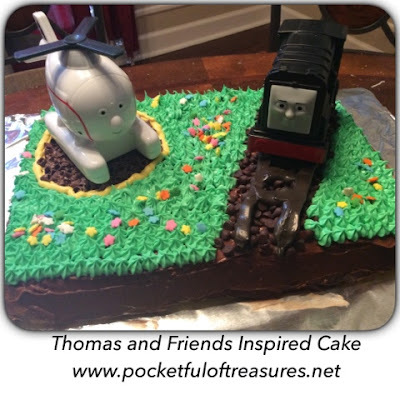 Do you have a child that loves Thomas the Train? 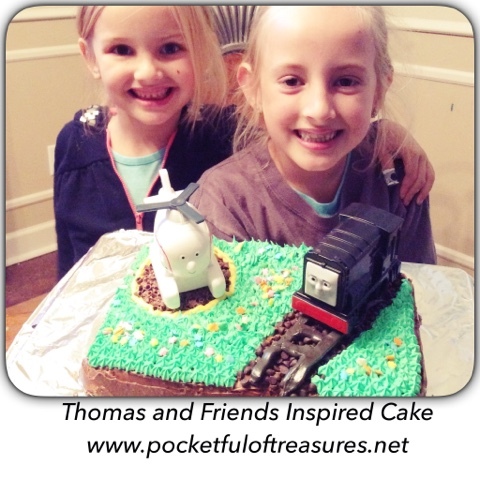 You'll love this fun, easy-to-make Thomas inspired cake! Bake a cake of your choice in a 9" x 11" pan according to the directions on the box (or your recipe). Allow to cool. *Scoop out approximately 1/4 of the chocolate icing and add black food gel until you reach your desired color for the train tracks. *Scoop out an extra large spoonful of white icing and add yellow dye (will be used to outline the helipad). 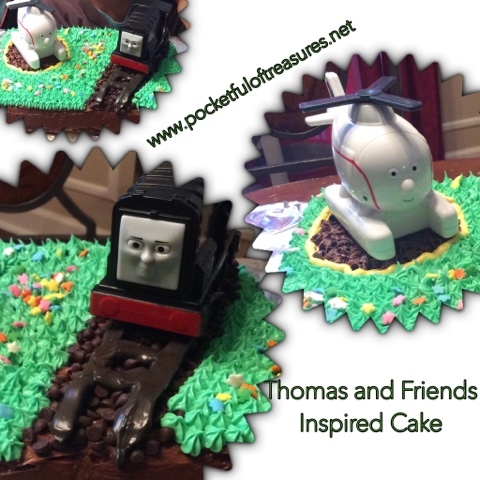 *Add green food coloring to the remainder of the white icing until you reach the desired color for the green grass on the island of Sodor. Cover the cake with a thin layer of chocolate icing. Don't forget to do the sides! 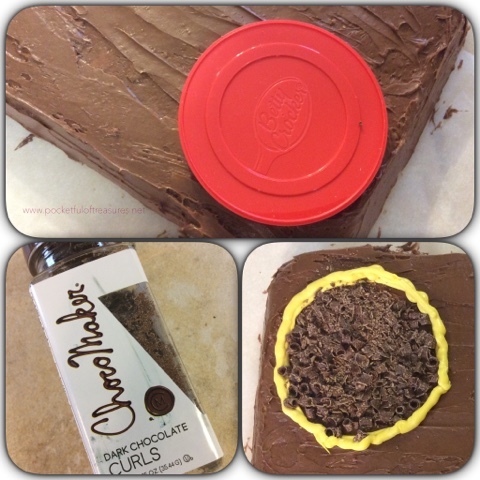 Use the lid to the icing to press a circle into the corner of the cake to make a template for Harold's helipad. Trace the circle with yellow icing. Fill in the circle with chocolate curls to make a dirt landing pad for Harold. With a toothpick, gently mark two diagonal lines equal distance apart (slightly wider than Diesel) on the other end of the cake. 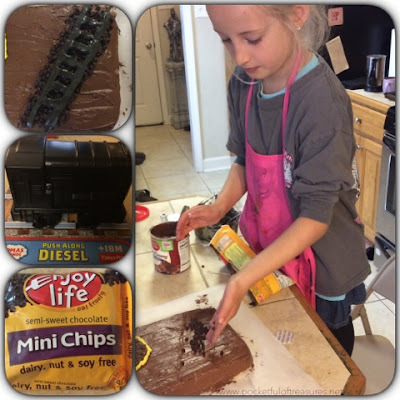 Fill in with mini chocolate chips (to be the rock bed of the railway line). About 1/4 inch in from either side make your straight railway track with your black icing. Add the cross ties. Wet a finger and rub it along your railroad to smooth the track and make it shiny. 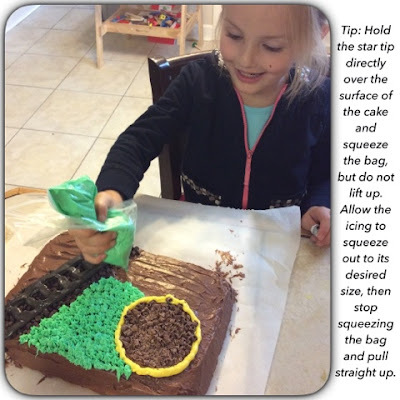 Use a star tip to add grass to the remainder of the top of the cake. April showers bring May flowers, even on the island of Sodor! Be sure to add your flower sprinkles. Place Harold and Diesel in position. 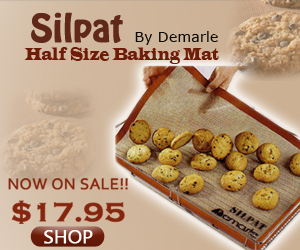 Visit my affiliate, BakeDeco for all your baking needs!